Is there movement already under way in the world of industry which will outstrip the painfully slow progress of the political world in facing up to the challenge of climate change? Amory Lovins certainly thinks so and his recent book, Reinventing Fire: Bold Business Solutions for the New Energy Era, explains why. Lovins is the co-founder, chairman and chief scientist of the Rocky Mountain Institute(RMI), a well-staffed non-profit organisation established thirty years ago and active in research and consultation on issues relating to energy and the efficient use of resources. The book is the product of some years of work by many RMI staff. It focuses the Institute’s current initiative to map and drive the transition from coal and oil to efficiency and renewables. Can the US realistically stop using coal and oil by 2050? And can such a vast transition toward efficient use and renewable energy be led by business? The answer the book gives to both questions is yes, based on painstaking exploration of existing renewable technologies and an assessment that they are already competitive with fossil-fuel-based industry for those who have eyes to see. The book is directed to the business world. It presents the energy transition as a major shift for a civilisation which has benefited greatly from fossil fuels but must now move from the old fire dug from below to the new fire which flows from above and works without combustion (save for a small amount of sustainable biofuel). It is a time of exceptional business opportunity for those prepared to recognise it and take it. The costs of oil and coal are rising as the price of renewables keeps on dropping. “The curves are already crossing. The endgames of oil and coal have already begun.” Lovins reminds readers that inattentive whalers in the 19th century were astounded to find they had run out of whale-oil customers before they ran out of whales. The book pursues the opportunity theme into four key areas of the economy – transportation, buildings, industry and electricity. Each area is discussed with an abundance of detail impossible to convey in a review but of fundamental importance in that Lovins’ solutions are a combination of many complementary factors. He doesn’t offer sweeping simple answers to the challenges of decarbonising the various sectors of the economy but gradually and exhaustively builds up the case for change in each area, demonstrating its feasibility and stressing its economic advantage. What is offered in the four key areas is not unfamiliar for the most part, but great care is given to explaining how the various options can be organised into achievable ends and due attention is always paid to any attendant difficulties. Technical detail is closely woven into the presentation. Where firms are already pursuing anything Lovins advocates their example is pointed to. It’s the rigour with which solutions are presented that is distinctive. An interesting facet of the book’s analysis is what Lovins describes as the surprising discovery that to achieve a largely fossil-fuel-free economy by 2050 “did not depend on pricing carbon or any other externality, it required no act of Congress nor any new taxes, subsidies or mandates; and it cost $5 trillion less than business-as-usual, creating big profit opportunities“. He is well aware of the hidden costs of seemingly cheap fossil fuels, but declares renewables are already cost-competitive even without counting those hidden costs. Which is not to say he sees no role for government. There are important regulatory steps that can substantially aid the transition. France’s feebate system, which rewards car efficiency and penalises inefficient cars, influences car-buying decisions and provides an incentive for auto makers to innovate. Aggressive and widespread energy standards and training are important in accelerating building retrofits. A requirement that producers take a life-cycle responsibility for their products would do a great deal to help industrial asset turnover and upgrading. Lovins places primary emphasis on the more efficient use of energy. Large gains can be had without any increase in energy supply. The book envisages new technologies and new ways of combining them which will result in many times more work from the same amount of energy, a process which is already clearly under way in many industries. The place of information technology in advancing energy efficiency is highlighted, with the development of smart grids a particularly promising area in which it can deliver remarkable innovations. The full contribution to be made by information technology to the efficient use of energy is as yet far from realised and represents a huge business opportunity. The book contains an interesting discussion about whether the transition will destroy the fossil-fuel companies. If they’re to survive they’ll have to change. Hydrogen, biofuels and “green” chemicals may enable oil companies to continue to use their infrastructure, and there may be other ways they can work at many small things. Lovins sounds a cautionary note about the conventional investments oil companies are continuing to make, particularly in high-risk frontier exploration and production. Such ventures look unwise business today. The oil age will end with falling demand, not with the exhaustion of the resource. As for coal owners, they “must either migrate to another business or figure out how to use coal not as a low-value, high-volume boiler fuel but as a high-value, low-volume reagent and reductant”. Many complain that China is recalcitrant on fossil fuels and will negate any other countries’ efforts to reduce their use. Lovins won’t have a bar of that argument. The opposite is the case he affirms at some length. He agrees that coal’s habits and bureaucracies remain powerful in China but says its star is starting to wane. “Its prices are rising, coal-fired utilities are losing money, environmental rules are tightening, and Chinese solar power is planned and likely to approach coal’s cost by 2015.” The transition has begun and China is the world’s leading manufacturer of many renewable technologies. Increasingly, as the US slashes its R&D budgets, technological development will be driven by China and others. The country is also making impressive progress with energy efficiency. Lovins suggests the US should draw inspiration from China’s efforts and move to catch up or go ahead in the greatest business opportunity of the age. The full interview is well worth reading for an overview of some of the major points his book makes. Whether the business world will go in the direction Lovins points may remain moot, but it won’t be for lack of prodding from the Rocky Mountain Institute. The book makes an impressive case. cf. this at planet3: does the book make any attempt to consider the physical and land limits of production and how efficiency fits into that picture? It’s obviously a very hard thing to calculate, but getting to within an order of magnitude of the problem must be a laudable goal. If it transpires we have to try and get through an energy bottleneck, it’s going to be important to know that! The book concentrates more on the economics and management of renewable energy than on the kind of question you draw attention to. CSP is mentioned as part of the picture, photovoltaics and wind more so. Distributed generation figures quite largely. In summary the book speaks of “a hybrid of centralised and distributed renewables, integrated by advanced communications and controls that securely chreograph supply- and demand-side resources nearly in real time, using islandable microgrids as necessary to secure resilience”. Lovins doubts that nuclear and CCS are going to attract sufficient investment to play a significant part in decarbonised energy. Lovins’s book sounds very interesting as it seems counter-intuitive.But,in the US possibly maybe,but elsewhere?India for example has significant coal reserves and I doubt that their exploitation will be curtailed by 2050.In any case,the book’s thesis does some to be very convenient:market forces and players will do the job so continued government innaction is right and proper.I wonder if AGW will do the decent thing and stop untill the transition has been completed.I’d better read the book,though. India’s coal reserves might have a place – for a while – providing power by a centralised generator to concentrated population centres. But the centralised-generation-plus-lots-of-distribution costs for the population at large will start to look very sick pretty soon. Local, industrial, village, small town, regional generation by wind or solar will probably be much more economic. As each area gets more economically viable, the costs for interconnection can be assimilated gradually. Much quicker economic development for each of the small regions. The prospect for local officials to just get on with providing power, rather than constantly re-negotiating for years to get their area up the priority list for connection to centralised generators, will be very attractive. Looks to be an excellent read. The transition from fossil-fuel to solar and related renewable energy sources is inevitable. The question is how much coal will be burned before it happens. Let’s hope that current downward trends in the cost of renewables continue and new coal development (e.g. South Island lignite) are delayed by whatever means possible. 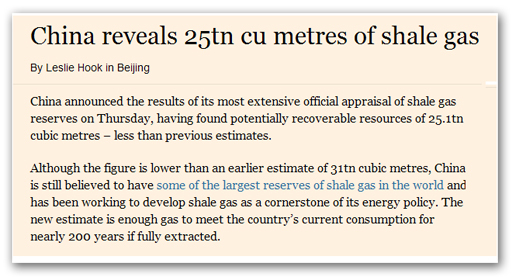 According to the FT (behind a paywall, sorry, but screenshot here), China has announced that it has 25 trillion cubic metres of shale gas. Enough to last 200 years. I have posted this link before, so apologies if this appears like spam, but the live readings from the UK grid give a fair indication of where we are at in terms of energy mix, in the UK anyway. If I were tasked with reducing emissions, using these figures, I’d look at decreasing coal in favour of gas, and ramping up nuclear, since these are by far the biggest figures. Why isn’t this being discussed? If you mouse over ‘Information’ below the UK chart of power by fuel type, they state that about 50% of hydro and wind is not yet directly metered and so doesn’t show. That said, unlike New Zealand, UK hydro is nowhere near enough to balance a large wind buildout, and since coincidence of usable wind at 30-odd percent capacity with demand peaks is pretty random, gas is the only power source reliable and flexible enough to fill the gaps. Gas puts out half the CO2 of coal, but makes up for that by leaking enough CH4 to have probably a worse effect in the short term. So if they’re really serious about their carbon footprint they should go full out on efficiency and build more nukes. Amory Lovins’ favourite- ‘Combined Heat and Power’- is just tarted up gas. You don’t always need the heat, but you always need the gas: it’s not green, just less black.